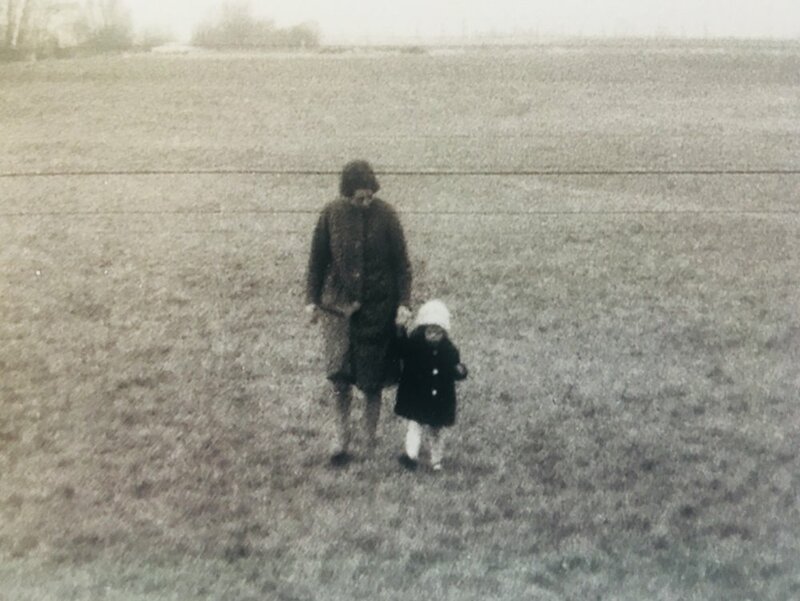 I've always loved this photograph of my Mom and me. We lived in Germany at the time and we were walking back home from one our little hikes around the countryside. I remember how she would hold my hand tightly so I wouldn't veer off the trail into the brush. My Mother would guide me and show me the way. I always felt a certain peace when she held my hand. On our walks, Mom would usually have binoculars around her neck. She loved to birdwatch. She would give me her binoculars, point at a small flower, and I would make the flower bigger through the lens. It felt like magic to me then. She taught me to do that; to notice little things in nature and expand them through my lens. I still do that today. "Never walk so fast that you don't notice," she would say. She gave the best advice. I had the privilege of being with her as she passed on. I held her hand tightly like she always did mine. It was my turn to walk her home. I hope she felt that certain peace I always felt with her. Sometimes, I can still feel her hand in mine and it reminds me to slow down and just notice. Sometimes we need a break from trying to figure it all out. Have fun with this reading today and take a respite from needing to know. There is peace in setting aside what can't be solved. How many times has another person’s comment impacted your day, your month, or maybe even your life? I have had more than a few clients whose attitudes about their person or their bodies were shaped by a comment someone made to them back in high school. A competent executive reflects back on being told she would never make the school track team because she was “chunky and slow.” She allowed the comment to erode her confidence, she didn’t tryout, and she still views herself as "chunky" and nonathletic two decades later, despite evidence to the contrary. We can read this and think it’s crazy, but we all know the long echo of a comment that hits a sensitive place. Confidence and sense of self comes from within. It’s a roller coaster to rely on the good opinions of others. If someone flatters you, you feel good. If someone makes a hurtful comment, you feel bad. Are you dependent on others to define who you are? Cultivating a strong place within you, a place of acceptance and compassion, requires you to identify and build on your signature strengths. Developing that strong place within, just like lifting weights at the gym, takes training. We all need and benefit from constructive feedback, yet integrating only feedback from external sources gives your personal power to circumstance. Creating a strong sense of who you are, no matter the externals, is a daily practice. Identify, acknowledge, and get to know your strong place well and put her in the drivers seat of your life. I had the privilege of facilitating another women’s retreat this past weekend. Our topic was ‘Reclaiming Your Best Self.’ The gathering place was a remote sanctuary on a beautiful horse ranch. We began with a meditation, then sat back to reflect; far removed from the noise of daily life. The power of taking a time out, in a facilitated retreat setting, is immeasurable. No technology, no interruptions, no distractions—just pure focus. This latest retreat was a group of long-term friends who were all facing similar transitions in their lives. This weekend, they wanted a personal growth component to their time together. I love facilitating groups as we all learn from one another. When one person opens up, we can see aspects of ourselves in their journey. When we step back and take the time to examine our lives with objectivity and compassion, we show up with more clarity. This clarity creates simplicity of purpose as we hone in on what truly matters on our daily path. When we get clear on what matters, we make myriad decisions ahead of time. We know what aligns with our most authentic expression and where we can make the most genuine contribution. We move from autopilot to a truly conscious relationship with our own life. You know where to find me if you’d like to host a group for a facilitated retreat. A favorite program is a half-day workshop that focuses on your most important relationship: the one you have with yourself. It’s amazing what a few hours dedicated to you can do not only for your psyche, but also for the many people who rely on you everyday. All that’s necessary is scheduling the time to do it. When my kids were little, part of my routine with them was what I called “quiet time.” I had a special box for each of them, filled with simple activities that I hoped would capture their attention. Every week, I’d add a little something to their box. They came to look forward to that quiet time alone. I loved this time because it allowed for getting my own work done uninterrupted. I didn’t know to create to my own routine with personal centering until much later in my life. Now it’s become essential to my well-being. I don’t have a quiet time box, but I have discovered what I need to ground myself in the midst of a noisy day. If I have the time, it might be a walk in nature. If my day is full, it’s 10-15 minutes with my soundproof headset and some carefully selected melodic music that allows me to connect within. We all benefit from finding daily space for personal centering; the research is compelling. The fundamental element is quieting the chatter in our minds. Just to be still. This simple letting go is a challenge for all of us. Our culture doesn’t reinforce doing nothing. We live our days “on call.” Answering the bell—whether the text, the email, another person’s urgency—is the way of modern life. The practice of taking a mental break, everyday, is one of the best health practices you can incorporate. So use your smart phone for your benefit—grab some headphones, close your eyes, and listen to a soothing playlist for 15 minutes. My current favorite is Dub Sutra. The first time I listened to the their captivating “Buffalo Dance” I was home—one of my kids burst in mid-song inquiring: “Mom, are you losing your mind?” I just loved that question as that is exactly what I was doing—letting go of all the to-do’s, the rumination, the thought stream. Now both my daughters are regular meditators and they’ve come to appreciate the unusually beautiful sounds of calm. My wish for my clients, family, and friends is to embrace 2017 from a place of self-compassion and personal strength. We all have hopes for the New Year whether we call them resolutions, intentions, goals, or big dreams. We also know that making changes in our lives can be challenging. As we make proclamations for what we want for ourselves this year—our most important task for sustaining positive change is reflection. Most resolutions fade as we get caught up in the many priorities of our life; yet it doesn’t have to be this way. Optimism and a can-do attitude are important elements of embracing behavioral change, yet they are only piece of the process. The cornerstone of maintaining personal commitment is truly understanding ourselves and how we operate when faced with the inevitable challenges of daily life. INTENTION: Know precisely and with great clarity what you want in 2017; include relationships, purpose, health, and spirit. OBSTACLES: Know exactly and in detail what gets in your way. STRATEGY: Expect and be prepared for distraction and disruption. What sets you up for personal strength? How will you respond when things don’t go as planned? INSIGHT: Creating sustainable change is not a light switch, it’s a process of understanding yourself in a deeper way. Identify your patterns and begin the process of knowing yourself. 1. Look at Your Life: To begin your New Year practice, take some time to review last year's calendar. For each month, examine your schedule and reflect on where you felt most empowered, least empowered, energized, or depleted. No need to overthink it—just write it down considering when where, what, and who. 2. Understand Yourself: Reflect specifically on what brought you strength this past year. Take that insight into 2017 and use it well! May you have an energetic start to the New Year and a strong finish! I came across coaching later in my life and I found it life-changing. My background is in counseling psychology and I was trained to provide guidance for clients dealing with emotionally significant situations. Counseling and therapy are an important and necessary part of mental health. I encourage it, I have provided it, and I know the benefits. Coaching is different. The coaching I practice begins with examining your thinking and your internal mind chatter. We have tens of thousands thoughts on a given day; they move through our minds like a ticker tape. We are biologically wired toward a negative bias with our thoughts. If we’re not aware of our thought patterns, we can literally be debilitated by our own internal voice. If you’ve ever asked yourself why you feel anxious, why you overreacted, or why you overate when you wanted to be healthy—you may be out of touch with a most important aspect of your daily health—your mind. Call it monkey-mind, autopilot, or just plain lack of self- awareness—what you illuminate and stick on in your mind matters. My coaching helps you connect with your mind with clarity and sensibility instead of letting it run wild through out your day. It’s a life changing practice to begin to really look at your own thinking. It opens you up to a new kind of personal freedom—the freedom to connect your thinking with your behavior. My clients describe it as “liberating.” It’s the difference between knowing something and the profound feeling of true knowing. Try paying close attention to your thoughts today. What is your primary thought throughout the day? Are you critical of yourself? Are you quick to judge? Paying attention to your internal messaging is as important as truly listening to another.